Businesses invest in content that gets people excited. Content that is general, which relates their product or service to popular trends, or that is frankly click-bait. This type of content waves hello at the internet, but doesn’t do much else. Why isn’t your marketing content converting into sales? Here’s why. All content should start a journey, taking the prospect from one stage to the next. Like a frog, hopping from lily pad to lily pad, your content needs to be meaningfully linked in progressive stages. If you’re blogging to boost SEO, but aren’t thinking about the journey your buyer needs to go on to purchase from you, the chances are your content isn’t doing what it’s supposed to. 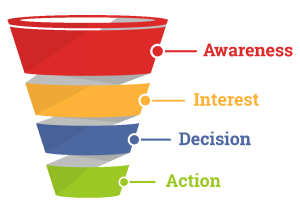 Your customer needs to go through a ‘funnel’ of decision-making. At the start of this journey, they’re aware of your brand, but as they consume more and more information, that changes to consideration and (hopefully) purchase. At the start of the journey, customers respond to emotional cues that tap into their pain points. How does your product or service solve their problems? After the initial excitement of discovering something new, all buyers need proof before they continue. Your marketing content might be getting them excited, but unless you’re backing up your blogs with case studies, testimonials, videos and brochures that offer hard evidence that you can be trusted, you can kiss goodbye to that sale. Sales content is designed to be shared within teams, to prove that your company is trustworthy, and demonstrate the value of what you do. Are your customers having to leap too far? Too much marketing, not enough sales? You’re excited to spread the word about what you do. You want that ‘buzz’ to boost brand awareness. But what about the rest of the buyer journey? Without proof and great sales content, you’ll get a lot of warm fuzzy feelings but no money being made. Too much sales, not enough marketing? It might be that you’re great at sales content, but have no marketing content in place. That means that fewer people are aware of your business, and when they do come across your product or service, you might come across as too sales focused. Too much marketing content won’t help to close sales and too much sales content makes you sound like a PPI salesman on commision. So you’ve got to work on finding the right balance — serving up the right content to the right people at the right time. This starts with knowing exactly who it is you are selling to. Every piece of content that you create should appeal to your ideal customer — the type of person your business was created for and who is most likely to buy what you’re selling. The ideal customer gets value from you thanks to your awesome content and even better products/services and gives it back in equal measure by championing your brand, referring you to others, giving feedback and waxing lyrical about you in a testimonial. Having a clear picture of your ideal customer brings all of your content in line allowing the marketing material to flow seamlessly into the sales stuff. What type of company is a good fit for my product or services? What size of company am I trying to attract? Can my product/services solve them? Why would they choose my company? Why wouldn’t they choose my company? What features do they expect in similar products/services? Which social platforms do they use? Which industry events do they attend? What do decisions makers like to do/read/watch? Do they add milk before or after pouring the tea? Answering these questions (the last one is optional) should give you enough to go off, but if you really want to get knee deep in your ICP, I recommend Lincoln Murphy’s article on this very subject. That funnel we talked about earlier… I want you to take it and break it in two so that on one half you’ve got Awareness and Interest and on the other, Decision and Action. Two halves, two things on each half. How about that for balance? Awareness and Interest, those are your marketing content. Which is what most businesses focus on. And rightly so. Research shows that 81% of people conduct online research before they make a purchase, while a massive 98% of website visitors won’t buy anything on their first visit to your website. People need to trust your brand and know that your product fits the bill. Marketing content — blogs, ebooks, ‘how-to’ guides, white papers, videos and infographics — all help towards creating awareness and building interest. It informs and teaches. But it doesn’t sell. At least not directly. What marketing content does do, though, is help you create marketing qualified leads (MQLs) — prospects that meet the ICP and have shown enough engagement with your content to suggest they’re ready to move on down to the business end of the funnel. Examples of MQLs could be someone who’s downloaded your ebook, read a blog post and reached out for more information or signed up for a newsletter and interacted with your emails. Once the charm offensive has worked and all of the MQL lights have turned green, it’s time for the person in question to become a sales qualified lead (SQL). An SQL has moved into the Decision and Action end of the funnel. At this point, they already know about your product/services. What they’re after now is a juicy bit of content that goes into depth about how your brand and its fancy product/services can solve their problems. They need convincing, basically. This is where you roll out the sales content. Why you are better than the rest, what makes your company the perfect fit and why are your products/services are tailormade for the prospect.. Sales content is where numbers are thrown down like a royal flush and names are dropped like you’re boasting about that time you blagged your way backstage at the Brits. Convince people with impressive stats, sales figures and previous clients. This can be done with email templates for follow-up emails, outreach emails and check-in emails, case studies (“we did this for this person and look at what a difference it made”), webinars, product demos, SlideShare presentations and one-pagers. And use data collected at the marketing end of the funnel, such as job title and company size, to segment your audience so that you can serve up personalised content (emails, blog posts, articles and case studies). Whether you’re a small business with a single marketing and sales team or a company large enough to have separate teams that can’t stand the sight of each other, finding that sweet spot between content that charms and content that convinces is all about pulling in the same direction. Marketing and sales alignment, they call it. And companies with good sales and marketing practices in place generate 208% more revenue from their marketing efforts, so it’s worth doing. Get everyone and everything on the same page. Be clear on your ideal customer, give sales reps input on content creation and produce content that speaks to customers at both ends of the funnel. 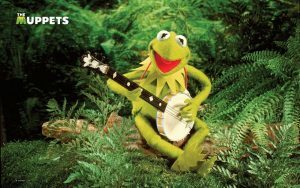 Do all that you’ll be as happy as Kermit with a banjo. Not a saying you’ve heard of? Just look at his little face. I had the great honour of collaborating on this post with my pal over at That Content Shed, Gareth Hancock. For more information on how we can drive a single content strategy in your business, book a free consultation today.